This can be anything done to correct imperfections in the appearance of the mouth. Anyone who is unhappy with their smile can have it fixed. The upper teeth show, usually, only when smiling, while the lower teeth remain hidden. This is reversed when talking, with the upper teeth remaining hidden while the lower teeth show. The color, alignment, spacing as well as regularity of the teeth are the characteristics that give the overall appearance. Any of these can be repaired to give a stunning look to the mouth.We offer a wide variety of cosmetic options. Some of these options are whitening, smile design, recontouring of the shape of the teeth, Lumineers, veneers, bonding, and all ceramic/porcelain crowns. Lumineers; Digitally Designed to Deliver a Beautiful Result with a Simple, Painless Process. 1st Visit:After your initial consultation, Dr. Robinson will take an impression of your upper and lower teeth, and send the molds to an authorized Lumineers labratory along with photos and other records that ensure the very best case for you. Unlike traditional veneers, there is typically no need for extensive drilling of sensitive tooth structure, shots or unsightly acrylic temporaries. 2nd Visit:On your next visit, generally a couple weeks later, Dr. Robinson will place your Lumineers. Before Lumineers are bonded in place, it is important to try them on to ensure a good fit. 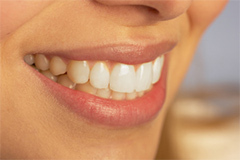 Teeth are then moderately etched to prepare for placement and then bonded one by one. Your dentist will then check your bite to make sure your contacts are balanced to avoid chipping your Lumineers through the course of daily function. That’s it. In only 2 easy and comfortable dental visits, you can have the beautiful natural looking smile you want! This is the procedure of making teeth whiter, and therefore more attractive. Our office uses several methods: Zoom!, passive tray whitening, and professional strength white strips.Zoom! is a revolutionary tooth whitening procedure. It's safe effective and fast, very fast. In just over an hour, your teeth will be dramatically whiter. The convenience of Zoom! in comparison to days of using strips or wearing trays makes it the perfect choice for the busy individual. The Zoom! Whitening procedure is simple. It begins with a short preparation to isolate your lips and gums. The clinician then applies the proprietary Zoom! whitening gel that is activated by a specially designed laser light. Teeth typically become at least four to ten shades whiter, sometimes more. A fluoride treatment completes the procedure. You'll be amazed with the results. In most cases, teeth get even whiter the first few days after the procedure. Take home trays with gel are recommended afterward for maximum whitening and maintenance.The tray method involves having impressions taken from which laboratory-fabricated custom vinyl trays are made. A carbamide peroxide gel is placed in these trays and the trays with gel are worn for about 3 hours, or overnight. The entire process takes 3-4 weeks of daily use. Three different strengths of gel may be used, however the higher the strength the greater the likelihood of reactions or tooth sensitivity. The tray method is recommended for badly stained teeth, such as tetracycline staining, and it may take several months of use to see significant color improvement. For maintenance of whitened teeth the trays should be used every several months.The end results whether using trays at home or doing Zoom! is the same. The cost of the tray method is about half compared to Zoom!, and there is usually less post-treatment sensitivity.